Important. Please remember, you need both the required fitness level, mountaineering technicals levels , ski mountaineerinmg technicals levels and the trekking technicals levels in order to enjoy any given trip, as our guides will assess your fitness and ability levels before embarking on any serious objective (current weather and mountain conditions are also taken into account). If they decide that a particular objective should not be attempted, then an alternative will always be offered. You do regular cardiovascular exercise 1-2 times per week (ie visit the gym, jog, walk, cycle, playsport etc). On a ski holiday – you are happy piste skiing all day with just the odd break for food and drink – but would struggle to ski off piste without finishing up very tired for the following day. You run/cycle ( or equivalent ) 2- 3 sessions per week. 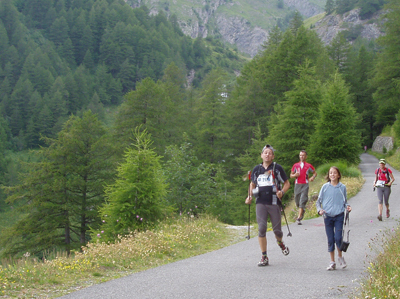 Ie you climb/bike/walk or run regularly at the weekends, plus once or twice during the week. At this level you should be happy doing either a 4-5 hr hillwalk, cycling 30 miles or mountain biking 2-3 hours without being exhausted. On a ski holiday – you are capable of off piste skiing all day or doing a couple of hours skinning with out finishing up exhausted – ie you can do this for a number of days without taking a rest day. You do cardiovascular sport 3-4 sessions a week. Ie you get out every weekend, plus 2-3 times midweek. At this level you are happy doing a 5-7 hr hillwalk, 50ml cycle or 3-4hr mountain bike ride without being totally cream crackered. If you are into challenges – then the thought of training to do a 1/2(or maybe even a full) marathon, wouldn’t seem too ridiculous. On a ski tour – you can skin at 300m/hr for 3-4hrs a day (ie 800-1200m of ascent each day). You train for sport 4+ sessons per week. Ie you are a keen sports person, who trains regularly. A 70 ml cycle ride, or 20+ mile hillwalk on a weekend would hold no fears. If so inclined, you might be the kind of person who has done a ~3.30hr marathon or similar challenges. Keen hillwalkers who happily knock off 3-4+ munros in a day also have this kind of fitness. On a ski tour – you can skin at 400m/hr or could hand le 4-6hrs skinning a day. (ie 1000-1400m+ of ascent each day). You train 5-6 sessions a week for competitive sport , have a background in the same, or you are annoyingly talented. Either way, doing a 100 ml bike ride or about a 3hr marathon wouldn’t be unreasonable. On a ski tour – you are happy skinning at over 400m/hr or could skin all day if neccesary (ie 1400m+ days). Above this – we are into the realm of talented and hard training sports people. If you are in this category, you probably already know what you are physically capable of – but please don’t overlook the importance of appropriate experience and mountain skills eg good footwork, climbing ability or snow and ice experience – which are just as critical as fitness for your success in the mountains. If your fitness or skills are in doubt however, there is a risk you could be excluded from an activity if your participation could risk the safety, success or enjoyment of the rest of the party. It is very unusual for us to have to do this, but it can occur if you are not realistic about your current experience or fitness levels, or you do not prepare sufficiently for the trip.